Walmart is making Reclaiming Our Health available at selected stores in Philadelphia, New Jersey, Maryland and Virginia. Get your copy today! Get Reclaiming Our Health at your favorite bookstore or online at amazon.com, bn.com, and www.michellegourdine.com. 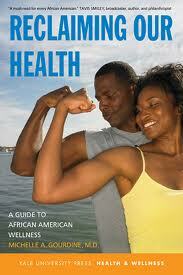 Reclaiming Our Health is available in hardcover, paperback, audio book and e-book form (for your Nook or Kindle).